Onix belongs to nephew Issa. She was a present to him from us, in the hope that by this means Issa would feel a personal connection to a place of importance to some members of his family and, as a "city kid", would perhaps have a wider view of his world than some of his contemporaries. 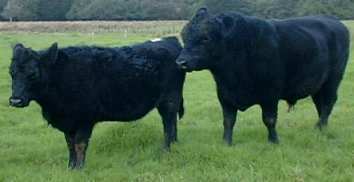 Onix had her first calf, Sapphire, when she was 2½ years old. 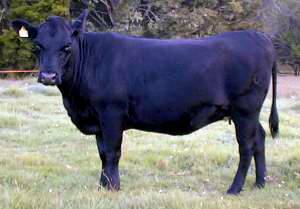 Daughter 456 was born in September 2003 and stayed on the farm for her whole life. 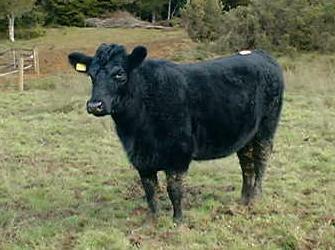 Onix had four other calves before she went to the works in 2008. Issa received the money from the sale of Onix's calves and paid a nominal sum for her upkeep and in the end he received the final works payout. 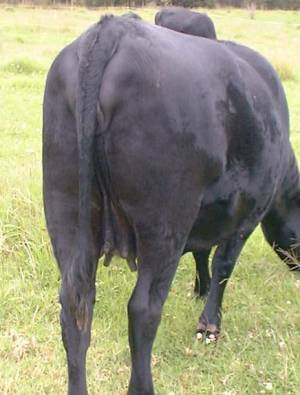 The white thing on her back is a dye filled indicator to show when she has been mounted by the bull or any of the other animals. That gives us an indication of when she has been "on heat" or "in season" i.e. able to get pregnant, which generally happens every three weeks. Since the indicator actually went red again after she went back to her own mob of cattle (away from the bull) we presume she is not pregnant. 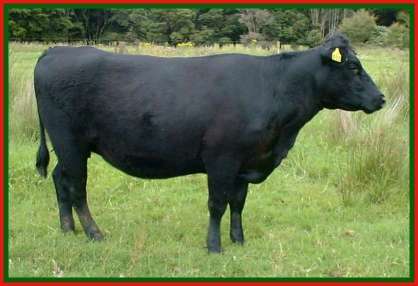 ...so her calving date should be between 19 March and 3 April 2002. The school holidays start on Friday 29 March, so it's possible Issa may be here when Onix has the calf. These days Onix is looking rather nice, rounded and bigger and quite the expectant mum. We'll have to get some more regular pictures over the next few months as she progresses through her pregnancy. Onix on the 24th of December, 2001. Onix's udder is beginning to develop. I suspect she'll calve just before Issa gets here for his holiday. 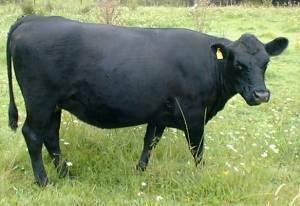 I would think she's now about three weeks away, so she'll probably calve around the 23rd of March. We shall see. 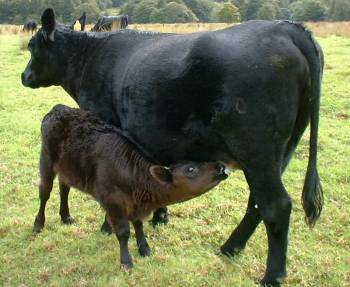 Onix's little udder is developing quickly now, here on Saturday 16th of March. Her back end is getting pretty wobbly too. I watch the udders and "bottoms" of the cows and heifers as they get closer to their calving times, because both start to change very quickly in the few days before the calf is born. Here is Onix feeding Sapphire, on Sunday 28 April 2002. Sapphire is growing at just over a kilogram per day and weighs about 75kg at the moment (which means she's probably grown around 40-50 kilograms since she was born). 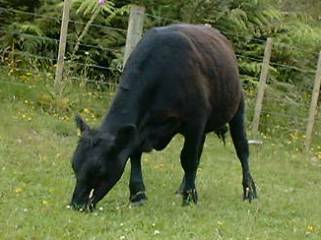 Sapphire was weaned at the age of eight months, in late November 2002. By that time she weighed 230kg, which wasn't terribly impressive, but she looks like a nice animal, so we'll wait and see how she turns out. Onix was served by Virago Quadrille 07 on Christmas day. She appeared to have been on heat again in mid-January (although she also appeared to have cycled at the beginning of her first pregnancy, so that may not mean anything). We will have to wait until we have the vet here to do the pregnancy tests before we'll know for sure if she is pregnant. Onix was pregnant on that occasion and has continued to appear to cycle in the period following conception each year. 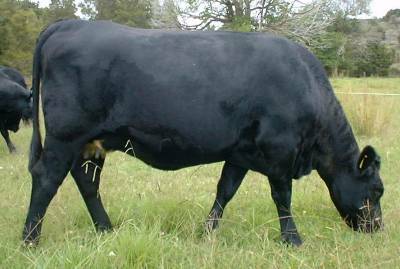 I changed her over from Autumn to Spring calving, along with the rest of her mob and her calves have improved every year. 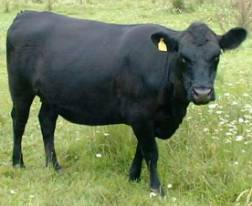 Sapphire was sold, but her second daughter remains here and has calved for the second time in the Spring of 2007. Onix hasn't managed to sustain Issa's interest and as she's becoming more and more temperamental as she ages, 2007 is likely to be her last calving year.